If you run into issues opening Office files and documents from SharePoint document libraries, here are some suggestions to help you fix them. You might consider syncing your document library with your computer to work with documents. Syncing creates a local folder on your desktop machine where you can open and edit files easily. 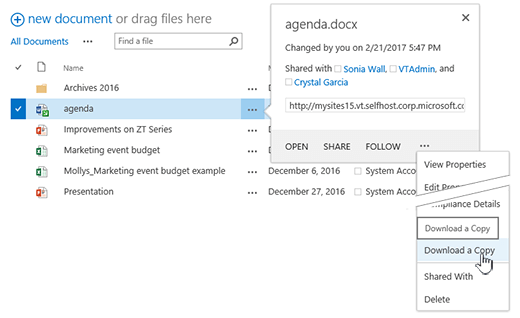 When you save a documents, it's automatically uploaded to the SharePoint or OneDrive for Business. 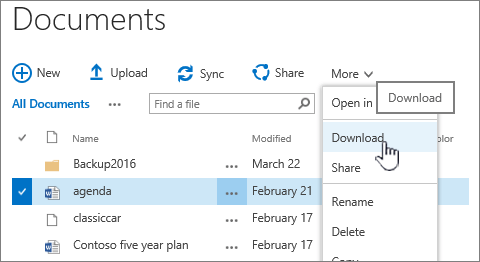 For more info, see Sync SharePoint files with the new OneDrive sync client. 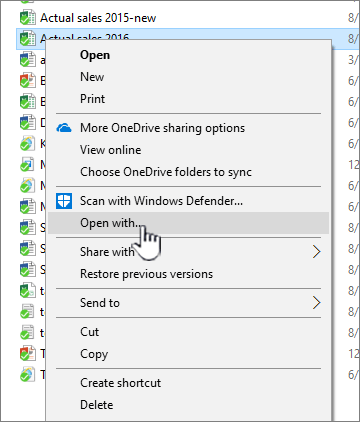 If the issue happens with Open with Explorer or View in File Explorer, see Open with Explorer and Explorer view. Some problems occur because of differences in versions of SharePoint server and Office. If you can't get it to work, try downloading the file and seeing if you can open it locally. In SharePoint Online, select the file, and click Download on the command bar, or click the ellipses (...) and then click Download. 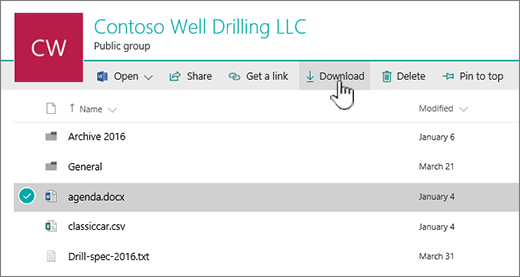 In SharePoint Server 2016, select a file, click More on the command bar, and click Download, or right-click the document, and then click Download. For SharePoint Server 2013, select a file, click the ellipse (...) click the ellipse (...) again in the dialog, and then click Download. ForSharePoint Server 2010, click the down arrow on a file, click Send to, and then click Download a copy. In your browser, click Save, and then Open folder to open the folder where the file is located. Right-click the file in the desktop folder, and then click Open With. Choose the app you want to use. If the file hasn't been assigned, it will pop up a dialog to select one. If the app isn't on the list, click Choose another app. Check the Always use this app to open box. 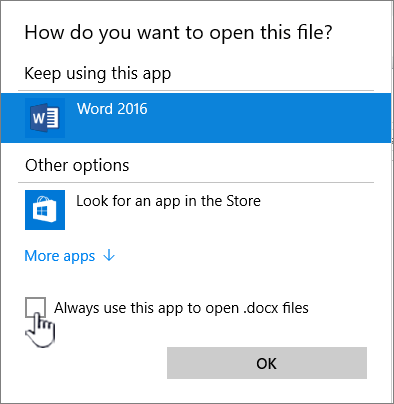 Close the app and try double clicking the file to see if it opens the correct app. To find the version of SharePoint you're using, see Which version of SharePoint am I using?. To get the version of Office you're using, see What version of Office am I using? or Find details for other versions of Office. Note: If you upgraded from an earlier version of Office to Office 2013 or Office 2016 on your computer, you might still have older versions of some programs like Visio and Project. If you use these programs, update them to 2013 or 2016. If you no longer use them, uninstall them. If the file opened previously, but now doesn't, there could be a problem with a corrupt file, or the format is not compatible with any of your apps. Make sure when you save a file, you try to open it to make sure it was saved correctly. If you're sharing a file with other users, be sure they save files completely and using the same file format. For example, if a spreadsheet is opened as a .xls, make sure it's saved as an .xls file. Newer versions of Office add new features that may not be available with older versions of Office. New versions can read documents created by older version, but older versions can't read newer documents. For example, Excel 2016 saves files in an .xlsx format, while Excel 2003 only reads .xls format. When sharing files in SharePoint, be sure your users have compatible versions of Office for documents. If you're using Office 365, you can install the latest version to your desktop from the online link. In Internet Explorer 10 or 11, if the menu is showing, click Tools, and then click Internet Options. 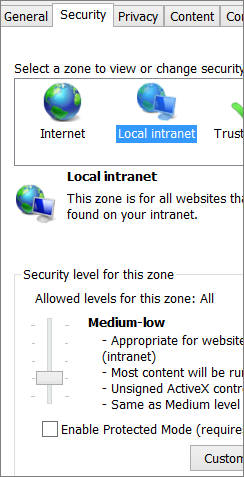 Click Local intranet and make sure that Enable Protected Mode turned off. Off is the default setting for Local intranet. To make sure the SharePoint ActiveX control is enabled, click Tools in Internet Explorer, and then click Manage Add-ons. Find SharePoint OpenDocuments Class, and then click Enable. You might need to switch to Show: All add-ons to find it in the list. Note: If you're using Windows 10 and Microsoft Edge, you might want to change your default browser to Internet Explorer 11. To change your default browser see Using Internet Explorer 11 in Windows 10 . Windows 10 ships with both Internet Explorer 11 and Microsoft Edge. 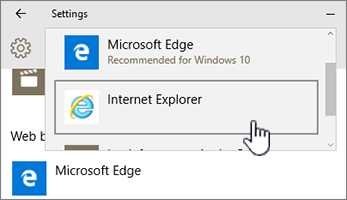 Edge is a modern browser that is updated often through Windows Update. The latest Microsoft Edge update was delivered with Windows update. Open in Explorer is only supported in Internet Explorer 11. Type Internet Explorer, and then select Internet Explorer. In Windows 10, click Start , type Default Programs, and then click Default Programs. Under Web browser click Microsoft Edge, and then click Internet Explorer in the Choose an app dialog box. Close the Choose default apps dialog box. If you're using an early version of SharePoint and Windows, it may use ActiveX controls to launch documents. If you have the choice of 64-bit Internet Explorer and 32-bit Internet Explorer, use the 32-bit version. Recent versions of SharePoint, such as SharePoint 2016 or SharePoint Online don't require ActiveX and are compatible with 64-bit Office and Internet Explorer. Read more about how to choose between the 64-bit or 32-bit versions of Office.